Which peas are your favorite ... sugar, snap or snow? Your sweet peas, of course! Our 'Two Peas' Short Sleeve Romper Set, with its exclusive UNISEX style, is designed with our uniquely-created pattern combinations to compliment rather than copy, allowing each twin to show off their own sense of style and individuality. 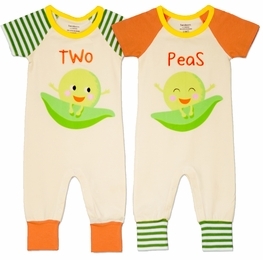 This super soft one-piece romper set showcases happy peas playing on their pod, accented with embroidered lettering, offering a fashionable fit for all-day comfort for busy twins on the go!